Dedicated freestyle/wakestyle riders who specifically want a board designed for massive pop, soft landings and unrivaled flat water performance. An upgraded Dura-Glide base gives the Asylum added durability for use on kickers, rails and sliders. Asylum characteristics: The 2017 Asylum delivers fast top-end speeds, aggressive edging and smooth load and pop, making this an ideal board for progressive and aggressive freestyle and freeriding. 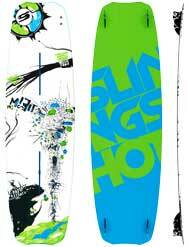 It features the most rocker of any board in our kiteboarding line. Its flex pattern and aggressive laser-cut channels are designed for speed, grip and superior hydrodynamics. The Asylum�s rocker and flex profile and durable base layup make it a great choice for riders who want a solid all-around freestyle board that can handle rough water and chop as well as the flatwater and the occasional kicker, rail or slider. Asylum rider profile: You�ll love the Asylum if you�re an intermediate, advanced or aggressive entry-level kiter who likes to ride powered-up, boost big and charge hard in all conditions. NEW Carbon bedrock inserts: In 2017 you will notice lighter boards, a more continuous flex pattern and performance that is tuned precisely for each board�s design concept. You asked for weight reduction, better flex control and increased feel. You got it. Our engineers accomplished this by inventing new carbon-reinforced inserts, which will replace the Fastrack system on all 2017 boards. In testing, our team riders quickly noticed how solid the inserts are, hence the name Bedrock Carbon Inserts. The new inserts are a Slingshot exclusive and are designed to offer you a solid connection to a board that still needs to flex. They use the industry-standard M6 hardware and are reinforced with light-weight, high-strength carbon fiber. With this development, our engineers were able to define a new level of performance and durability in twin tip construction. The insert pull strength is increased by 30%, while the overall board weight is cut by 10%. Base and rails: Slingshot base thicknesses are as follows: Refraction- .7mm DuraGlide base; Asylum- .4mm standard base; Misfit- .2mm standard base; Karolina Pro- .2mm standard base. All Slingshot twin tips are lined with a full urethane rail, which provides dampening and protects the board form impact. For 2017, we�ve been able to achieve a broader, more vibrant range of colors for our urethane for even more visual appeal. NACA tech laser channels: Precision laser-cut NACA Tech channels allow Slingshot to fine-tune each board in its lineup for specific performance characteristics. Channels improve water flow and board speed, grip and pop, edging and general performance and feel. Slingshot wood core construction: Every Slingshot kiteboard is hand built in the United States, in a small factory just down the road from company headquarters in Hood River. Boards are made from vertically laminated wood cores. This process utilizes the collective strength of the wood�s end grain and creates boards with unrivaled pop, rebound and flex characteristics. Nothing beats a wood core. 2017 Slingshot Asylum from Slingshot Kite on Vimeo. 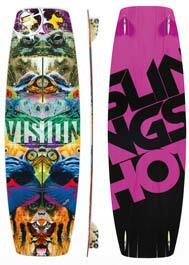 Misfit characteristics: One of Slingshot�s longest-running boards, the Misfit is a time-tested design perfect for general freeride kiters who want a twin tip they can use anywhere, in any condition. The Misfit features mild rocker and a relatively stiff flex pattern, making it a board that cuts up wind and beats through chop exceptionally well. Laser-cut NACA channels give the Misfit precision contour at the tip and tail, which helps channel water to generate speed, grip, load and pop. Misfit rider profile: You�ll love the Misfit if you�re an experienced kiter who wants a solid all-around board that will work well for all aspects of the sport, or if you�re an entry-level kiter looking for a board you can learn and progress quickly with but will not outgrow. 2017 Slingshot Misfit from Slingshot Kite on Vimeo. Slingshot blends high tech manufacturing with classic wood core construction in the 2016 Slingshot Vision. This freeride and freestyle twin tip is built around a Pacific Albus wood core, which gives the board unmatched flex and resiliency, and is then infused with Slingshot�s exclusive manufacturing techniques that include laser cut NACA TECH* channels, a rugged DURA base, Fusion Sidewall, Chined Rails and an inlaid Fastrack mounting system. These features, and the board�s elliptical concave and continuous rocker shape, combine to create an unparalleled all-around freestyle board that accelerates through the water with ease, cuts up wind efficiently, provides insane pop and soft landings and is durable enough to withstand abuse of the world�s hardest-charging kiters. 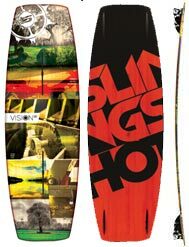 Like all of Slingshot�s twin tip boards, the Vision is built proudly in the United States with high-quality materials sourced from the Pacific Northwest. Construction includes an all-wood Atomic Core that provides the best flex, performance and durability out of any core material on the market. 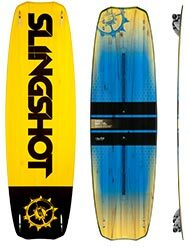 Slingshot�s exclusive Fastrack mounting system is integrated into the core of the board and gives riders ultimate control when mounting footbeds or boots. 2016 Slingshot Vision from Slingshot Kite on Vimeo. The Asylum returns to Slingshot�s 2016 lineup as our weapon of choice for powered-up freestyle riders looking to push themselves - and their gear - to the next level. With an aggressive rocker, wide profile and flexible wood core, the Slingshot Asylum delivers massive pop and outstanding flex and rebound performance. Precision laser-cut channels improve performance and tracking, with or without fins, and help channel water away from the rider, thus increasing board speed and reducing face splash. 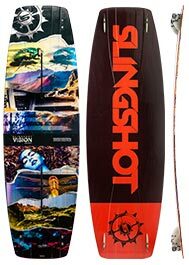 With Slingshot�s top-end materials and bombproof construction, the Asylum is an excellent selection for riders looking for a board they can use both as an all-around freestyle ripper and a rail, slider and kicker crossover. 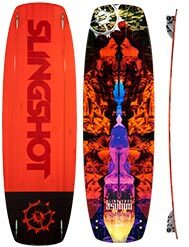 Like all of Slingshot�s twin tip boards, the Asylum is built proudly in the United States with high-quality materials sourced from the Pacific Northwest. Construction includes an all-wood Atomic Core that provides the best flex, performance and durability out of any core material on the market. Slingshot�s exclusive Fastrack mounting system is integrated into the core of the Asylum board and gives riders ultimate control when mounting footstraps or boots. 2016 Slingshot Asylum from Slingshot Kite on Vimeo. 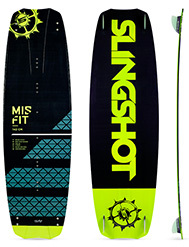 Geared toward the freeride kiter looking for a solid board that will deliver consistently in all wind and water conditions, the 2015 Slingshot Misfit incorporates a mix of cutting edge technology with tried-and-true American manufacturing to bring one of the best and most durable all-around boards on the market. Available in 132, 136, 142 and 146 sizes, this crossover wood-core board has moderate rocker and a stiff flex, making it an ideal all-terrain vehicle for riders of all levels. Stylishly updated graphics from Slingshot�s design team compliment the Misfit�s legendary construction, which incorporate precision laser-cut NACA (National Advisory Committee for Aeronautics) channels modeled after aerospace engineering concepts. These channels help pull water from the middle of the board to the tip, generating speed, grip, load and pop as it carves through the water. 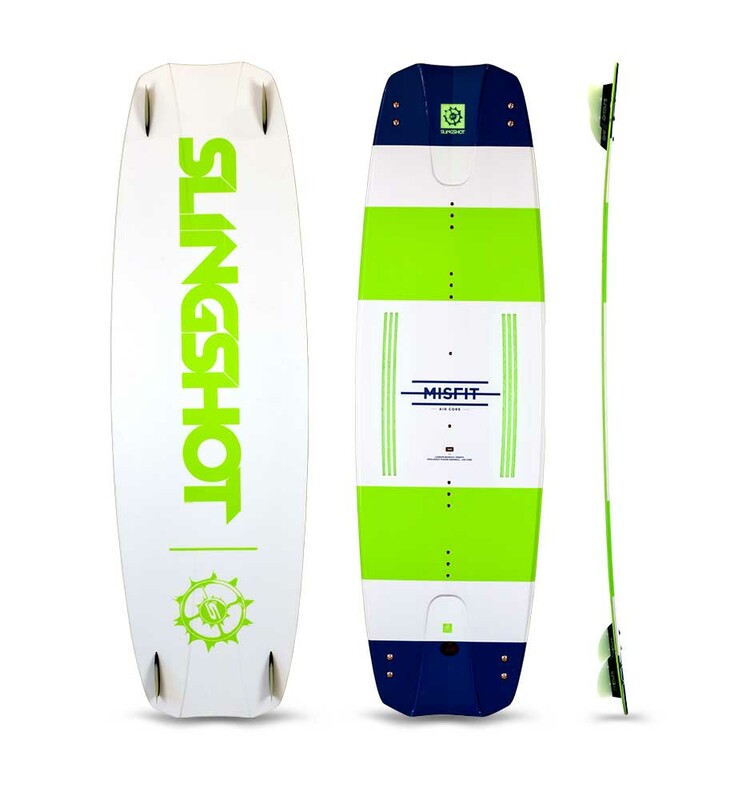 Like all of Slingshot�s twin tip boards, the Misfit is built proudly in the United States with high-quality materials sourced from the Pacific Northwest. Construction includes an all-wood Atomic Core that provides the best flex, performance and durability out of any core material on the market. Slingshot�s exclusive Fastrack mounting system is integrated into the core of the Misfit board and gives riders ultimate control when mounting footstraps or boots. 2016 Slingshot Misfit from Slingshot Kite on Vimeo. The Slingshot Vision returns for 2015 supercharged with new features like our super tough DURA-base to make it the ultimate freestyle kiteboard. We�ve stiffened the Vision�s flex pattern to increase pop and soften landings. Our proven outline and rails prevent spray by focusing the water down and away from the rider. Our laser cutting technology enables us to go where the competition can�t with the first ever NACA TECH* channel configuration on a full wood-core board. Like a vacuum, the NACA TECH channels water from the middle of the board to the tip, accelerating it through the channel and increasing the overall board speed and grip to the water. Combining NACA TECH with our refined rocker line, the Slingshot Vision will maintain its place at the head of the class in freestyle boards. *NACA: National Advisory Committee for Aeronautics (NACA). US Federal Agency founded to undertake, promote, and institutionalize aeronautic research. 2014 Slingshot Vision from Slingshot Kite on Vimeo. 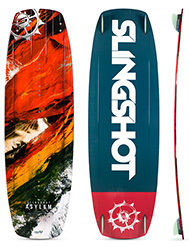 The Slingshot Asylum returns for 2015 as a top choice of elite pros and everyday core riders. The board�s unique blend of precision laser cut channels and aggressive rocker allows any riding style to excel. Features for the Slingshot Asylum 2015 include the industry�s only Atomic Wood Core with laser cut channels. Flex performance is magnified through our Future Response Technology, delivering massive pop and outstanding flex/ rebound characteristics. Precision laser cut channels offer all the drive you need for upwind performance as well as insane tracking through all water conditions. Engineered to ride with or without fins. However you choose to ride your Asylum, rest assured you�ll be backed by Slingshot�s legendary construction and durability. 2015 Slingshot Asylum from Slingshot Kite on Vimeo. New for 2015, the Slingshot Misfit now features precision laser cut NACA TECH channels. That�s right, we put aerospace design into a kiteboard. The Misfit has raised the bar again for performance freeriding. The Misfit�s proven versatile shape, combined with Slingshot�s legendary construction and durability is the benchmark for rider improvement. Engineered to provide a consistent rider controlled flex and pop, the Slingshot Misfit will satisfy the needs of any rider. With the addition of our precision laser cut NACA Duct channels, we took freeride performance to a whole new level. Like a vacuum, the NACA Duct channels water from the middle of the board to the tip. The directed water accelerates through the channel and increases the board speed and grip to the water. The benefits to the rider are increased edge control and reduced drag through the water. Hand built in our U.S.A. factory, the Slingshot Misfit features the highest-quality and greenest materials available on the planet. 2015 Slingshot Misfit from Slingshot Kite on Vimeo. Ideal for riders requiring massive pop and control in any condition and any style of riding. Vision is what drives innovation and it is the force behind the new 2014 Slingshot Vision twin-tip. Inspired by the performance and versatility of the RPM kite, the Vision was created to bridge the gap between competitive and recreational riding. All the features on the Slingshot Vision were carefully tuned to deliver a balanced ride for all ability levels and style. Starting with a completely new approach, we dialed in the Vision�s flex pattern to deliver outstanding pop and soft landings, regardless of whether you are riding boots or footstraps. The Vision�s outline and chined rails prevents spray by focusing the water down and away from the rider. With the addition of laser cutting technology we were able to create the first ever �bonzer� channel configuration on a full wood-core board. Combined with a continuous rocker line that delivers smooth turns and landings while still providing maximum edge control and maneuverability. The 2014 Slingshot Vision is built with the �legendary Slingshot construction� using only the highest-quality and greenest materials available. Realize your Vision. A wooden core freestyle board with massive rocker to cut through chop and aggressive pop with very appealing graphics. With its reintroduction last year, the Slingshot Asylum has quickly become a rider favorite among our dynamic team as well as everyday core riders. The next generation 2014 Slingshot Asylum delivers magnified flex performance through its premium Atomic Wood Core, aggressive pop and outstanding flex plus unmatched durability. The full wood core releases stored energy lightning-quick and more forcefully than ever through increased edging power while maintaining momentum on flat landings. Engineered to ride with or without fins, this board pops hard on ollies, whips for hard-core freestyle, slides right on rails and even boosts big off any wave. Our unique blend of precision laser cut channels combined with an intense rocker profile allows any riding style to excel on this board. The Chined Plane Rail combined with a progressive outline prevents spray by focusing the water down and away from the rider while providing smooth turns and maximum maneuverability. The 2014 Slingshot Asylum offers a fast and snappy feel that�s engineered to take your aggressive freestyle riding to the next level. It can be equipped with boots or it comes standard with the new Bold-On 4.0 strap-pad system, which is very easy and fast to mount. The stance and the duck of the straps-pads (or boots) can be fully adjusted, because the board has rail inlets. The straps are very soft and give a very good grip. Really an advancement in the market. 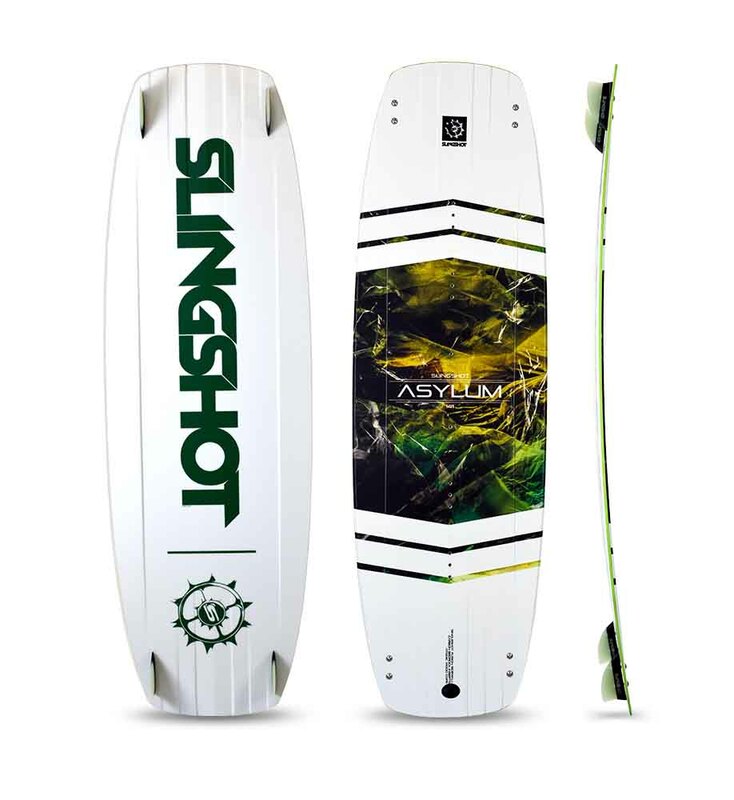 Hand built in our U.S.A. factory, the Asylum kiteboard features the highest-quality and greenest materials available. 2014 Slingshot Asylum from Slingshot Kite on Vimeo. The Slingshot Misfit continues to deliver controlled progressive flex and top-level performance better than ever. Our full wood core absorbs and releases energy, adding a lively and responsive feel to the riding experience. Engineered to take your skills to the next level, the 2014 Misfit kiteboard provides a more dynamic feel than a traditional molded-foam board and provides smooth riding through chop without kicking spray in your face. The Slingshot Misfit�s proven, user-friendly outline offers exceptional upwind drive and killer load-and-pop capability. A short and effective edge makes for lightning-quick hookup and ultimate edge control in the harshest of conditions. Hand built in our U.S.A. factory, the Misfit kiteboard features the highest-quality and greenest materials available. 2014 Slingshot Misfit from Slingshot Kite on Vimeo. Which board is right for me? 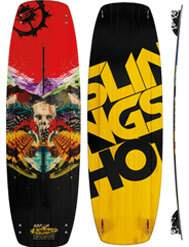 The Slingshot twin-tip boards speak for themselves. The Asylum and the Vision are for sophisticated riders Both boards have “continuous rocker lines”, which cut extremely well through chop and which give extreme pop and soft landings. They are in the beginning tricky to ride upwind, but once you have figured out how, in particular the Asylum goes better upwind than probably any other board. The Misfit is an excellent beginners and intermediate board, extremely easy to ride upwind. Hand Built In The USA - The Slingshot Board Factory from Slingshot Kite on Vimeo. "The Vision is a freeride-freestyle crossover board with an feel on the water that can only be described as �buttery� � its amazingly smooth on even the choppiest water..."
"Let�s get one thing straight, the Asylum twin-tip is a balls-out, loud-mouth, in-your-face freestyle machine that caters to freeride needs secondly..."